Left to right: 2018 Syngenta Glyndon, Minnesota Fusarium head blight trial comparing yield results from Miravis Ace, Caramba® and Prosaro® 421 SC fungicide treatments. GREENSBORO, N.C., April 15, 2019 – Miravis® Ace fungicide for improved control of Fusarium head blight (head scab) in wheat is now available from Syngenta for the 2019 season. 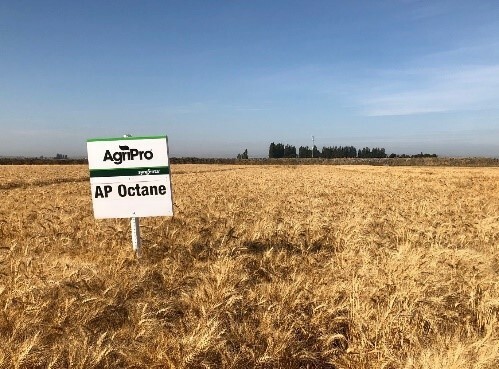 The convenient premix of propiconazole and Adepidyn® fungicide, a new mode of action for head scab, will help wheat growers unlock a completely new way to manage head scab and get ahead of diseases such as Septoria that could be more prevalent if current weather patterns continue. With conditions ripe for disease development and great turbulence in wheat futures, Syngenta believes growers will be looking to find every opportunity to push yields, test weight and quality to their maximum potential in 2019. To learn more about Miravis Ace performance, visit sprayearlier.com or talk to your local Syngenta sales representative. Join the conversation online – connect with Syngenta at Syngenta-us.com/social. 1FAD150A3-2018US All trials resulted in statistical significant differences between treatments. 15 trials across 11 states. 2Prosaro 421 SC is not labeled for use at 50 percent head emergence, and no recommendation or suggestion for use at this timing is being made. Data is intended solely for comparison at this application timing with Miravis Ace, which is labeled for use as early as 50 percent head emergence. ©2019 Syngenta, 410 Swing Road, Greensboro, NC 27409. Important: Always read and follow label instructions. Some products may not be registered for sale or use in all states or counties. Please check with your local extension service to ensure registration status. Miravis® and the Syngenta logo are registered trademarks of a Syngenta Group Company. All other trademarks are the property of their respective owners. Illinois grower Dan Luepkes recently found himself in a familiar position, as his soybeans secured the highest yields in back-to-back years of the Illinois Soybean Association Yield Challenge’s North Regional Group 1 division. Luepkes.